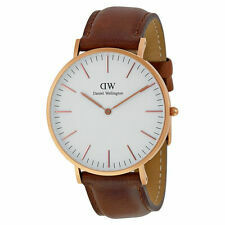 Daniel Wellington DW0506. 100% authentic watch. Case color is Gold. 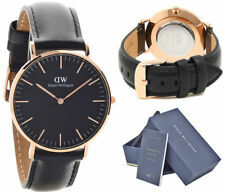 Daniel Wellington 0901DW. 100% authentic watch. Case color - Gold. Pre-owned in original DW box. Daniel Wellington Watch. Condition is New with tags. Shipped with USPS First Class Package. 100% authentic watch. New in original DW box. In used condition with wear on band as shown in photos. 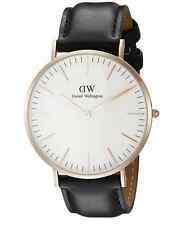 Daniel Wellington Classic Black Durham 36mm Brown Leather Black Dial Wrist Watch. Condition is Pre-owned. Daniel Wellington 0507DW. New and 100% authentic DW watch. 32mm case; 14mm band width. SOLD WITH DANIEL WELLINGTON BOX. NO PAPERS. There are no scratches or stains on it, though the battery is dead. The original box is not included. Getting to the battery could be hard but if you have an exacto knife laying around its quite easy to pop the battery compartment open. I received it at a Boy scouts trading jamboree for some cheap pocket knife so I have no use for it. 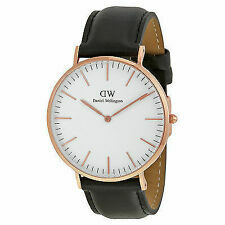 Women’s Daniel Wellington Classic Sterling Watch DW00100164. Condition is New with tags. Shipped with USPS First Class Package. CLASSIC BLACK | 40MM. Dial color: Black. Case thickness: 6mm. Strap color:Brown. Strap: Leather Strap. Never worn. Unwanted gift. 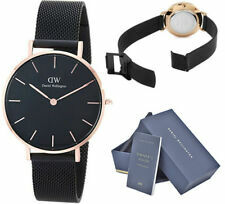 New In Box Daniel Wellington Gold Mesh Strap Watch And Cuff Gift Set. Condition is New with tags. Dispatched with Royal Mail 2nd Class. Multi-color band watches are great for adding a pop of style to any look. With a unique band color, they are excellent for a signature timepiece. White band wristwatches are traditional and tasteful accessories that will never go out of style. They have popular designs, which is sure to instantly add to any ensemble. Yellow case wristwatches will add a hint of color to any look. With a unique case color, these Daniel Wellington watches are excellent for a one-of-a-kind timepiece. Silver case watches are chic timepieces. Impressive in their simplicity, they have a traditional appearance for a perfect wardrobe essential. Purple face watches will add a hint of color to any outfit. They have a unique appearance for a distinctive statement. Timeless yet chic, white face wristwatches will add instant style to any ensemble. With popular designs, these watches are great if you're looking for a versatile style. 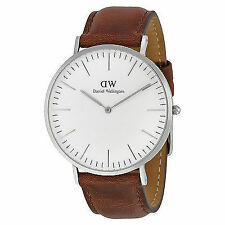 Which Daniel Wellington wristwatches are popular among ebay shoppers?